One of the longest-running VPN services on the market, PureVPN strays from typical VPN offerings by providing premium add-ons that users can pay for the enhance their service. This ability to stop paying for what you don’t need makes PureVPN a unique option for both new and experienced VPN users alike. With tremendous value, world-class security, and unique features that you can choose to make your VPN experience even better, PureVPN truly does have a lot to offer. Additionally, you’ll have access to more than 2,000 servers in over 180 locations, unlocking more than 300,000 IP addresses to stay safe and anonymous online. PureVPN has straightforward, standard pricing that offers significant discounts the longer you commit to the service. The standalone month to month service is priced fairly average for the industry at $10.95 per month. 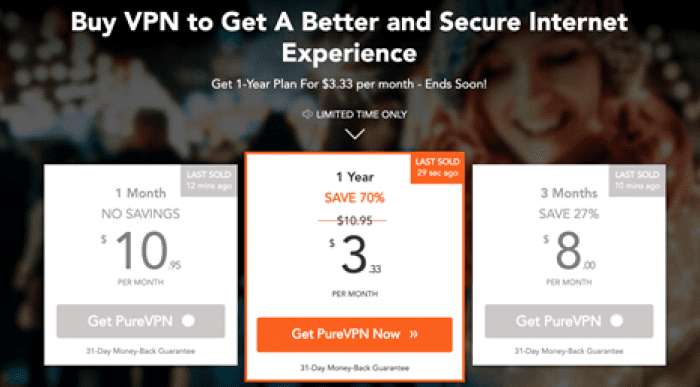 While there isn’t a free trial period like you’d find with other top VPN services, PureVPN does offer a 31-day money back guarantee, so if you don’t enjoy the service, you can always get a full refund. For a slightly longer commitment, you can sign up for a three-month plan. This option is currently priced at $8.00 per month, which isn’t a significant saving when compared to the month to month plan. Instead of going with the three-month plan, you’re much better off going with the one-year plan, which at the time of this writing is priced at just $3.33 per month. Going from $8.00 per month to $3.33 per month is a huge cost reduction. When the total cost of a three-month plan is $24 and the cost of an entire year is only $39.96, the one-year plan is definitely the way to go. If you keep your yearly subscription, you’ll still get a better deal on your second deal, but you won’t get if for $3.33 per month. According to PureVPN, you’ll get your second year for $69.95, or $5.83 per month. All plans come with the same features with the option of purchasing premium add-ons. What makes PureVPN even better is the ability to make anonymous payments. You can pay for your service with your credit card, debit card, or PayPal, but you can also pay via Alipay, CoinPayments, PaymentWall, BlueSnap, and even gift cards. These additional payment options further mask your identity and protect your information online. PureVPN offers a ton of great features for all of its users, with the option to add on even more premium features to enhance your experience. Taking a look at all of these great features, $3.33 per month is a really great value. The premium features are affordable as well, adding very little to the monthly cost of the service. While most people won’t need all of the premium features, they’re good to have just in case. While PureVPN is no longer the fastest VPN service on the market, it still provides impressively-fast speeds both domestically and internationally. 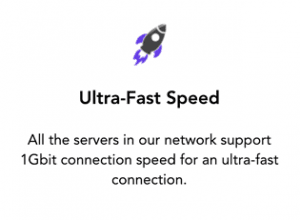 In fact, speeds typically aren’t reduced by more than 10% on domestic servers, and average 50% slower on international servers. Upload speeds are impacted more dramatically, but that’s the case with any VPN service. What’s nice about PureVPN is the sheer number of servers available around the world. Server proximity plays a major role in the overall speed performance of a server, and with over 2,000 servers in more than 180 locations, chances are there’s always going to be a server nearby. If speed is your top concern when it comes to a VPN service, which isn’t typical for most users, there are other services that are faster than PureVPN, but may not be as secure or offer as many features. PureVPN does offer dedicated streaming servers to reduce lag and buffering, however, Netflix’s VPN-detection protocols block some of PureVPN’s servers from accessing the streaming service. While access to Netflix on any VPN can change from day to day, it seems that currently, Netflix is winning the battle. There are great Netflix self-help guides on the support center page to help you troubleshoot your Netflix connection issues. Nevertheless, there are plenty of other streaming services out there that work with PureVPN, and the dedicated streaming services do make a major difference in the stream quality. As PureVPN adds even more servers, there may be additional access to Netflix. If you’re someone who is an avid P2P user, PureVPN is an excellent option when it comes to torrenting. 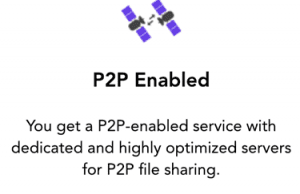 Offering dedicated P2P servers and support, as well as a premium P2P protection feature that you can purchase, PureVPN has the tools and resources you need to safely and securely torrent on the network. The P2P protection feature doesn’t mask your torrenting activity as some users may think. It’s an automatic virus, malware, and adware detection and blocking program that keeps your devices safe. Heavy P2P users may want to invest in this premium add-on to stay secure online. As we mentioned, PureVPN is compatible with most connected devices, including Windows PCs. The dedicated desktop app is relatively user-friendly and allows the user to customize their experience when they launch the platform by selecting which connection type they’d like to use (streaming, file sharing, etc.) Selecting the VPN connection-type presents customized options for the user, including server options and additional features. Select your security protocol on any server, switch servers whenever you want, and even track your bandwidth usage right from the dashboard. We like the fact that PureVPN presents different features, settings, and options depending on the kind of browsing experience you need. It’s nice to see a VPN provide a platform that’s more than just an ‘activate’ button. Whether you’re on a Windows PC or a Mac, you’re going to get the same VPN experience. Select your connection needs and explore the many features and settings that PureVPN has to offer. Be sure to check out the various menus, as some of the settings are hidden from the main screen. Macs are inherently designed to be ultra-secure, and when you pair your Mac with PureVPN, you’re getting enhanced security that keeps your information safe and secure. Not only can you use PureVPN on your Windows and Mac devices, but you can also use PureVPN on your Android, iOS, and Linux devices. Secure all of your connected devices by using the dedicated Chrome and Firefox add-ons. PureVPN takes it even further by allowing you to connect routers, Rokus, FireSticks, Chromecasts, and even your gaming consoles to the service. PureVPN’s network seems to be constantly growing. Currently, PureVPN has over 2,000 servers in more than 180 locations. While some of those servers are virtual servers, a large majority are dedicated physical servers. Don’t see a server in the location you need? You can actually request a server to be installed in any location across the world. There’s no guarantee that it will happen, but it’s pretty cool to see that PureVPN takes customer feedback so seriously. Remember, you can switch servers as many times as you want, allowing your identity to be masked by one of over 300,000 active IP addresses. Every server has multiple security protocol support, including OpenVPN, PPTP, IKEv2, and more. PureVPN takes security very seriously. With military-grade 256-bit security protocols and proprietary security programming at the server level, PureVPN offers an impressive lineup of security features. First, you can switch your security protocol on any server at any time. While we recommend using OpenVPN, you can change your security connection whenever you want, which is something that isn’t often seen in the VPN market. Servers also utilize Ozone, an additional security feature that proactively protects you and your device, 24 hours a day. You’ll also get an automatic kill switch feature, meaning your information is safe if your VPN connection drops. There are a few premium add-ons that you can purchase to take your online security even further, including DDoS Protection to protect you from potentially devastating online attacks. PureVPN also focuses heavily on leak protection, including DNS and IP leak protection. That means that your identifying information won’t get into the wrong hands and you’ll be masked by one of PureVPN’s IP addresses. No matter when you need support, PureVPN’s live support team will be there to answer your questions and concerns. Featuring a live 24/7 chat team, help is just a click away. Most VPN providers have moved away from email-only and ticket-based support systems, but not all VPN providers have 24/7 support teams. However, just because PureVPN has moved away from those methods as their primary support system, doesn’t mean they got rid of them entirely. Not everyone has time for a live chat, and there may be issues that don’t need to be resolved right away. You still have the option of emailing PureVPN’s support team or submitting a help ticket for your issue. Featuring a state of the art support center, self-service has never been better. The easy to use support center dashboard lets you quickly navigate popular topics, including troubleshooting, starting your service, and how-to guides. PureVPN is still one of the top VPN services in the world, and it’s easy to see why. From competitive speeds to enhanced security protocols, PureVPN has a lot to offer. With prices starting at just $3.33 per month, it’s hard to find a service that’s significantly less than that, especially when you consider what features are included. While the premium add-ons will increase that monthly cost, there are a few premiums that are definitely worth it. When it comes to speed and security, PureVPN provides some serious value in both areas. With minimal speed reduction both domestically and internationally, you’ll get a seamless browsing experience virtually anywhere in the world. The enhanced security features also give PureVPN an edge over some of its top competitors. The Ozone program and the ability to select your security protocol on any server are two fantastic features that go above and beyond in the name of online privacy and security. At the end of the day, PureVPN is a great choice when it comes to staying secure online. There may be services out there that are cheaper, and there may be others that provide more specialized, targeted features, but few have the robust features that PureVPN does at this price point. Want us to review a VPN service that we haven’t yet? Let us know in the comments below!